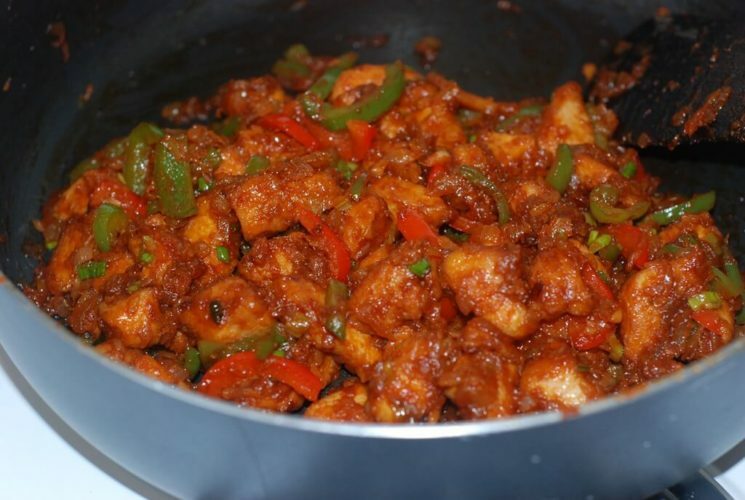 Here is delicious chilli chicken recipe at home step by step instructions .For some of us, its just the food and for the rest of us, its something more than that, its LIFE. They say, some people eat because they have to live but it is also true that some people live so that they can eat (chilli chicken) and try each and every dish that has ever been made anywhere. If you want to know how to make tasty chilli paneer recipe then click on the link. Here is the step by step instructions on how to make delicious chilli chicken recipe at home. You can deep fry the chicken pieces if you prefer, I tend not to as we eat it so often. Also I have used chicken thigh which are a much more succulent cut and despite frying and then simmering in the gravy, doesn’t dry out. I have used Kecap manis which is a thicker and slightly sweeter soy sauce and is ideal to get a dark rich sauce but if you can’t find any just swap it for a dark soy and add a pinch of sugar to balance the flavour. Also a regular shop bought chilli garlic sauce for this recipe is great. Heat oil in a wide sauce pan or a wok to the level of 1cm. In a mixing bowl add the corn flour, plain flour, chilli powder, black pepper and ginger garlic paste along with the salt. Add the vinegar and water; mix to make a thick batter. Add the chicken pieces to it and mix well coating all the pieces with the batter. Fry the chicken in the hot oil in batches for 1-2 minutes. They should have a slight colour all over. Drain the chicken on kitchen paper and set aside. To make the sauce; heat the vegetable oil in a wok or kadhai on a medium heat. Add the white part of the spring onions and fry for a few seconds followed by the green chilli, chopped garlic and chopped ginger. Fry for 10 seconds and add the green peppers along with the red onions. Sauté for 1-2minutes until they begin to soften. Add the chilli garlic sauce and the dark sticky soy (kecap manis) & stir well. Add the water and bring to a boil and simmer for a 1 minute on a low heat. Add the corn flour water mix, season to taste and simmer for a further 2 minutes as it begins to thicken. Turn the heat off and cool the sauce slightly. your delicious chilli chicken recipe is ready to serve.